Scholars have shown that educational experiences within the classroom may marginalize students of color which may result in psychological distress. However, the utilization of culturally responsive educational practices (CRE) can create environments in which marginalized students can thrive not only academically, but psychologically. The authors provide a qualitative case study examining the culturally responsive practices of one teacher through a relational cultural theory (RCT) lens. 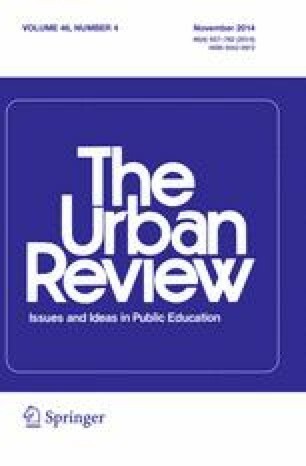 The findings suggest that CRE practices may serve as psychological interventions that are associated with decreased psychological distress and increased psychological well-being amongst students of color. Specifically, students demonstrated behaviors depicting a number of RCT’s five good things, including zest, empowerment, connection, clarity, and self-worth, that improve psychological well-being according to RCT. Florida Department of Education. (n.d.). Return on investment/school efficiency measure: Linking learning and costs. Retrieved January 9, 2009 from http://roi.fldoe.org/. National Council for the Accreditation of Teacher Education (NCATE). (2008). NCATE unit standards. Retrieved June 27, 2013 http://www.ncate.org/Standards/NCATEUnitStandards/UnitStandardsinEffect2008/tabid/476/Default.aspx.